I went to a great wine tasting on Friday, “Flights,” put on by ZAP, the Zinfandel consumer and trade group I’ve known and enjoyed for many decades. The event was held in the elegant, posh Palace Hotel, in San Francisco. A “flight” is a series of individual wines, tasted and evaluated side by side. All of the wines share a common theme. In this case, the theme was that they were all comprised of Zinfandel, or of “related” grape varieties. These “related” varieties, which included Petite Sirah, Alicante Bouschet and Carignan[e], are not related to Zinfandel in any ampelographic way. Instead, the relationship consists in the historical fact that Zinfandel was frequently interplanted with the other varieties by [mainly] Italian-American immigrants in the 19th and early 20th centuries; the wines made from them (the grapes were often co-fermented) are called “field blends.” These old vineyards, once threatened with being torn out for housing development or with being replaced by more popular varieties like Cabernet Sauvignon or Pinot Noir, have been rediscovered over the years, with the vines lovingly tended. Some of the very interesting wines made from them were included in the tasting. There were four flights, 13 wines in all. Here are my tasting notes, followed by a brief discussion. My notes follow my traditional pattern: starting with color/appearance, then proceeding through aromatic notes to flavors and finish. McCay Cellars 2015 “Faith Lot 13 Estate,” Lodi. $32, 13.8% alcohol. Bright, clean. Red berries, esp. raspberries. Lots of peppery spice, sandalwood, briary notes. Delicious! Medium-bodied, elegant, claret-like. Good acidity, very well-balanced. Score: 93. Easton Wines 2015 Estate, Shenandoah Valley (Amador County). $35, 15.1%. Darker, riper than the McCoy. Prune and dark chocolate aromas. Flavors of Dr. Pepper, cassis, tapenade. Full-bodied, a little porty and hot. Score: 87. Day Zinfandel 2016 Grist Vineyard, Dry Creek Valley. $43, 15.2%. Made by Ehren Jordan, of Failla. A stellar wine, classic Dry Creek Zin. Good garnet color. Complex, alluring aroma: earthy, briary, spicy, tobacco, raspberry, toffee, licorice. Super-spicy, deep, juicy, fabulous complexity. No heat at all, refreshing acidity. Score: 94. Hendry Wines 2015 Block 7, Napa Valley. $36, 15.4%. Darkest of all. Exotic aromas: wild mushrooms, blackberries, licorice, pepper. Deep, dark chocolate, berry and coffee flavors. Full-bodied, spicy, full-throttle Zin. Long finish. Will age. Score: 90. Ravenswood Winery 2015 Angeli Vineyard, Alexander Valley. $42, 14.5%. 100% Carignan, grown in the hot region of Cloverdale. Very dark color, purple-black. Aromas of meat (teriyaki beef), blackberry, coffee, black raspberry, spice. Very deeply flavored, enormous mouthfeel, yet elegant and balanced. Very good. Score: 92. Ridge Vineyards 2015 “Geyserville”, Alexander Valley. $48, 14.5%. A blend of 70% Zinfandel, 15% Carignane, 12% Petite Sirah and 3% Alicante Bouschet. Very dark color, very ripe. Chocolate, blackberry, coffee, spice flavors. Tastes hotter than the official 14.5%. Some raisins, prunes, lots of sweet, savory fruit. Very tannic. Too ripe for me. Score: 88. Bedrock Wine Co. 2017 Papera Ranch “Heritage,” Russian River Valley. $60, 14.6%. From Morgan Twain Peterson, son of the Flights moderator, Joel Peterson. From a vineyard planted in 1934. 49% Zinfandel, 44% Carignan, 7% “other.” Very dark. Complex aromas of spice, licorice, mincemeat, blackberry, blueberry. Insanely rich and sweet, glyceriney. A bit clumsy now, needs a few years to settle down. Score: 89. Turley Wine Cellars 2016 Hayne Vineyard Petite Sirah, Napa Valley. $75, 14.4%. Very, very dark. Big, eruptive aromas of meat, fig, briar, blackberry, cocoa. Full-bodied and stuffed with big, sweet tannins. Leathery tastes and feeling, with more sweetness emerging mid-palate: sandalwood, peppermint patty. Delicious, gulpable. Score: 90. Beekeeper Cellars 2012 Madrone Spring Vineyard Zinfandel, Rockpile. $NA, 14.75%. Contains 20% Petite Sirah. The vineyard is between 1,200’ – 1,500’. Good, dark saturated color. Impressive aromatics: black currants, raspberries, spices, coffee-toffee, vanilla. Very rich, sweet, fruity, long finish. Will age, but fully drinkable now. Score: 92. Matrix Winery 2016 Bacigalupi Vineyard Red Wine, Russian River Valley. $38, 15.6%. This is a 50-50 blend of Zinfandel and Petite Sirah. The color is inky black, impenetrable to light. The nose is muted at first, gradually suggesting earthy tobacco, blackberries and spice. Very tannic, and pretty oaky. Oodles of sweet black fruits, cinnamon bun, cocoa, with some overripe raisins and heat on the finish. Needs time. Score: 90. St. Amant 2017 Alicante Bouschet, Lodi. $21, 12.93%. Good translucent garnet color, so much lighter than the Petite Sirahs. Lovely, uplifted raspberry, vanilla, cedar and spice aromas and flavors. Pinot Noir-like in texture, silky and satiny, with delicate raspberry fruit and refreshing acidity. Very fine, delicate, delicious. Score: 91. Once & Future 2016 Teldeschi Vineyard Frank’s Block Zinfandel, Dry Creek Valley. $50, 14.8%. Inky-black color, no doubt from the Zinfandel and Carignane, which constitute 88% of the blend. The remainder is Alicante. Deep, bold, assertive aromas: packed with wild blackberries, earth, tobacco, leather, clove, anise. Full-bodied, lots of sweet fruit, figs and currants. Super-high quality. Score: 92. Hartford Family Vineyard 2016 Dina’s Vineyard Old Vine Zinfandel, Russian River Valley. $60, 14.9%. Mainly Zinfandel, with 6% Alicante Bouschet and a few drops of other, undefined varieties. The color is very dark. The aroma is spicy and earthy, with notes of blackberries, cassis, blueberries and cocoa nib, as well as some overripe raisins. Dry and tannic, a big, ripe barbecue wine, although a little too robust for my taste. Score: 89. The surprise of the tasting was the Alicante Bouschets, so out of place among those dark, tannic, heavy wines. What a pity more California winemakers don’t play with it, although who can blame them? The public is hardly ready for yet another obscure varietal. Among the Zins, Carignanes and Petite Sirahs, the Zinfandels showed best. Zinfandel is a noble variety in this family; the others can rise to the occasion, but always show some rusticity. Every once in a while, I still get some wine to review, even though I retired three years ago. The latest batch includes a very good Zinfandel from Sonoma County, and eight wines from the Great Lakes State, Michigan. Beekeeper 2016 Montecillo Vineyard (Sonoma County); $65. This is one of those big, galumphing, blood-warming Zins that brings thoughts of summertime barbecued ribs or wintertime hearty stews. The grapes got really, really ripe, soaking up the sun in their vineyard, 1,500 feet above Sonoma Valley. First the flavors hit cherries—then they soar into blackberries—and then finally burst onto the raisins and black currants that high alcohol so often inspires in Sonoma Zin. (The official reading is 14.5%, but I suspect it’s higher.) The tannins are considerable, but they’re Zinny tannins, furry and slightly bitter, like the skins of mulberries. The wine spent 15 months in 25% new oak barrels, but there’s nothing oaky about it, just an aura of vanilla and caramel, although the wood also lends tannins. Wonderful acidity, thorough dryness, a very nice, deliciously voluptuous Zinfandel, although it is on the pricy side. Score: 92. The article stressed the “tremendous growth” of Michigan’s wine industry, which contributed an aggregate $5.4 billion to the state’s coffers. The leading wine production area is perhaps Old Mission Peninsula, a cool-climate growing region of 19,200 acres, a smallish appellation equal in size to California’s Carmel Valley, and containing only nine wineries. Located on the 45th parallel, the same as Bordeaux, Piedmont and Willamette Valley, the peninsula lies in the northeast corner of Lake Michigan; winters are cold, but are tempered by the proximity of water on both sides, while summertime growing conditions are ideal: the temperature seldom rises above 80 degrees, and nights are as cool as they are in California’s wine valleys. Chateau Chantal 2016 Proprietor’s Reserve Trio (Old Mission Peninsula); $27. This is a Meritage-style wine, although the Merlot and Cabernet Franc have a tiny drop of Pinot Noir in there–why, I don’t know, but it doesn’t hurt. The alcohol is 13.5%. I’m giving it a good score because it shows real Bordeaux flavors and suppleness, even though it’s not particularly complex or ageable. If you’d given it to me blind, I might have guessed Italy, but certainly not Michigan! It’s fully dry, with firm but pliant tannins and a good bite of acidity. But the best sign of all is that it gets easier and nicer to drink as you drain the bottle. Not all wines can say that! The winemaker suggests drinking with “rich meat-based pastas with traditional Italian red sauce” and I totally agree. Score: 90. 2 Lads Winery 2016 Cabernet Franc (Old Mission Peninsula); $35. With 15% Merlot, this wine shows some green pea flavors alongside the cherries, blueberries and spices, in the fashion of a Loire Cab Franc. It’s fully dry (good), with nice, silky tannins and a mouthwatering bite of acidity, as well as some subtle oak. I mention the Merlot because it brings added weight and texture to the Cab Franc, which on its own can be light. The alcohol is a refreshingly low 13.3%. As tasty as the wine is, it isn’t an ager; if anything, it will go downhill fast. So drink up soon. Score: 88. Hawthorne 2016 Rose Table Wine (Old Mission Peninsula): $12. Rosé is in many respects the hardest wine to make. It requires the delicacy of white, but with at least some of the body of red. This wine largely succeeds. It’s medium-bodied and rather darkly colored for a blush; the blend is based on Cabernet Franc, with lesser amounts of Pinot Meunier, Gamay, Merlot and Pinot Noir. No oak was used, so all you get is the fruit: raspberries and strawberries, with a tobacco spiciness. Acidity is high, although not searing. Best of all, for me, is the dryness: absolute and total, with lowish (13.2%) alcohol. All in all, a success. The winemaker recommends drinking it with chicken, salmon or game, but I think the range is far greater, because the wine is so versatile. I’d even drink it with a juicy steak. Score: 89. Black Star Farms 2016 Arcturos Sauvignon Blanc (Leelanau Peninsula); $18. I have definite expectations of what I want a Sauvignon Blanc to be: dry, crisp and elegant (as in Sancerre), with a citrus and tropical fruit taste and, sometimes (as in Marlborough) a tang of green gooseberry. It should never be sweet, as too many California Sauv Blancs were in the 1990s. This bottle satisfies on many levels—not all. It is indeed dry and crisp, and there is a tanginess, even a spritziness, that refreshes the palate. I’m not sure if there’s any oak; sadly, the tech notes don’t say (which they should). If there is, it’s subtle. There is a bit of heaviness that’s hard to define, except that the wine lacks that delicate finesse a light white wine needs. I’ll rate it at 87 points and say that it’s a pretty good buy for a wine to drink with a firm, full-flavored fish, such as halibut. The Leelanau Peninsula, like Old Mission Peninsula, sits at the 45-degree latitude near Lake Michigan, and is thus cool. Chateau Grand Traverse 2017 Dry Riesling (Old Mission Peninsula); $13. A lovely white wine, light and delicate, perfect for summertime fare, or now that we’re headed into cold weather, light lunches or starters like smoked trout, scrambled eggs, a leafy salad of greens and citrus fruits. As the label states, it’s mostly dry, yet there’s plenty of rich, ripe green apple and peach fruit, white flowers and Riesling’s slight hint of petrol, with honey showing up on the finish. Refreshing acidity provides a grapefruit tang; almost effervescent, but not really, just mouth-awakening. The alcohol is only 12%. At this price, I’d buy it by the case. Score: 90. Mari Vineyards 2017 Gamay Noir (Old Mission Peninsula): $26. I think of the Gamay Noir grape as midway between the light, refreshing fruitiness of the Gamay varietal, which is what French Beaujolais is made from, and the more serious Pinot Noir. This is a light-bodied wine, silky and smooth, with pronounced acidity and flavors of sour cherry, cranberry, cola, orange zest and sandalwood. It’s bone dry, and the alcohol is a mere 13%. Not particularly complex or sophisticated, but pleasant enough. I’d call it gulpable: drink up and don’t overthink. Score: 87. Brys Estate 2016 Reserve Pinot Noir (Old Mission Peninsula); $32. California and Oregon have nothing to fear from Michigan in the Pinot Noir department, to judge by this wine. It’s okay in its dryness and zesty acidity, as well as the gentle tannins and silkiness you expect from Pinot. But there’s very little substance. Some cherry-berry fruit, a sprinkle of white pepper and cinnamon, a touch of oak. But the complexity Pinot Noir needs to go beyond being a drinkable little wine to a truly fine one just isn’t there. Score: 86. Bowers Harbor Vineyard 2017 Unoaked Chardonnay (Michigan); $16. I’ve tasted a ton of unoaked Chardonnays from many countries but I have to say this is not one of the better ones. Chardonnay doesn’t need oak to succeed, but it does have to be ripe and opulent. This wine is neither. It’s watery and bland, and moreover has some unpleasant green notes, like bell pepper. Score: 81. A few nights ago I pulled the Charles Krug 2008 Vintage Selection Cabernet Sauvignon (Napa Valley), which cost $75 on release. The color was still as inky dark as a young Cabernet, but after almost precisely ten years, the aromatics and flavors had turned the corner, picking up secondary (although far from tertiary) notes. The fresh blackberries and black currants I found when I initially reviewed the wine, in the Autumn of 2011 when it was three years old, were still there, but “growing grey hairs,” as they say, becoming more fragile, and showing leathery notes and, perhaps, a little porty, due to high alcohol, namely 15.7%. In my early review, I wrote that the wine was “certainly higher in alcohol than in the old days, but still maintains balance.” In those olden days (never to come again, alas), Krug’s Vintage Selection, always 100% Cabernet Sauvignon, hovered in the 12-1/2% range. Gerald Asher, writing in the early 1980s, credited Krug’s “influential legacy” (along with Beaulieu, Martini and Inglenook) as having contributed to “the seeds of all [stylistic Cabernet] options available to winemakers today,” a statement that remains true. His fellow Englishman, the enormously influential Michael Broadbent, in The Great Vintage Wine Book, went him one better. He gave the 1959 Krug Cabernet his highest rating, five stars, calling it “most perfect” and “a lovely rich wine,” and added, amazingly, that his friend, Edward Penning-Rowsell, who wrote the best book on Bordeaux ever (The Wines of Bordeaux), “could not fault it,” rare praise indeed from an oenophile who opined about his specialty, Bordeaux, for decades in the Financial Times. James Laube, the most important American wine critic after Robert Parker, was of more ambivalent opinion. While he called Krug’s Cabernets (first produced in 1944) “grand, distinctive [and] long-lived,” his scores on the 100-point scale were less impressive. In his 1989 California’s Great Cabernets he managed only two 90-plus scores over more than four decades of vintages of the Vintage Select (as it was then called). I scored the 2008 Vintage Selection 93 points in 2011, and would do the same now. Admittedly, that wine took an enormous departure from the Krug Cabernets Asher and Broadbent loved. The high alcohol is a conceptual problem, and perhaps makes pairing it with food more challenging, but these are matters for our imaginations, not our palates. Organoleptically, the wine still provides good drinking. Even on release the $75 price was a bargain, when, for example, Grgich Hills already was $150, and Jarvis was a sky-high $315. 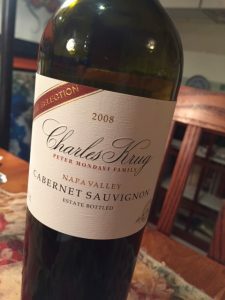 Charles Krug had by then long lost its luster among the label chasers, a fickle bunch, and it must have been hard for Krug, used to being at the top, to be so overlooked, or maybe disrespected is the better word. It’s always risky to predict the future of such wines, but I would not be surprised if the ’08 Vintage Selection is still purring away contentedly in 2028. In France “piperade” (pronounced something like “pip-rod”) is a Basque stew of onions, green peppers and tomatoes, spicy and garlicky. 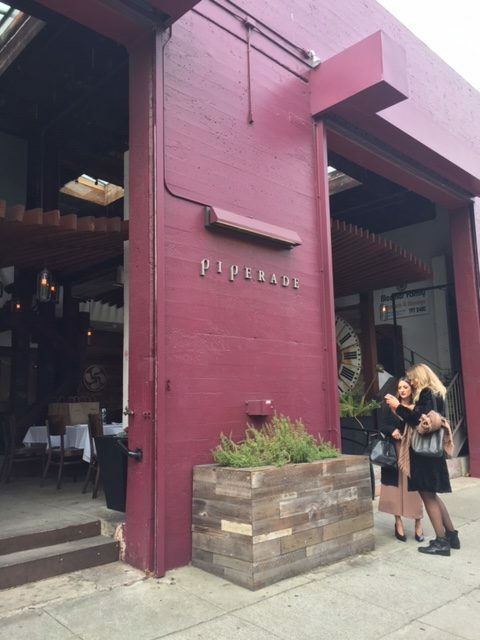 In San Francisco, it’s the name of Gerald Hirigoyen’s restaurant, which opened in 2002 and has long been a fixture on the San Francisco Chronicle’s Top 100 Restaurants list. It’s situated on Battery Street, an old-timely San Francisco neighborhood at the junction of North Beach, Chinatown and the Financial District, just below the cliff of Telegraph Hill: old brick buildings, lovingly restored, that now house tech hubs and architectural firms. I have to say how impressed I was by all five wines. The white, which was served as a conversation starter before we sat down for the meal, was fine, clean and savory, a blend of 70% Sauvignon Blanc and 30% Semillon. The red Bordeaux was equally satisfactory, being dry and somewhat austere, although elegant. The official retail price of both–$17.99, although I’ve seen them for less—made me inquire where in the Bay Area I could find them. As we progressed through the lineup, the red wines all showed true to form: the Médoc more full-bodied than the Bordeaux, the St. Emilion wonderfully delicate and silky, and the Pauillac the darkest and sturdiest of all, as you might expect. The flight was capped off with 2010 Carruades de Lafite, the “second wine” of Lafite-Rothschild, just for the sake of comparison. As good as it was–and it was!–the other wines had nothing to be ashamed of. During the meal, where most of the other guests (about 15 in all) seemed to be bloggers, the topic arose concerning Bordeaux’s status and popularity in the California market. I weighed in, as is my wont : ) I mentioned that younger people are looking for unusual, often eccentric wines—the kind their parents never drank—which means they’re not drinking Bordeaux. But, I added, there’s a reason why Bordeaux has been the classic red wine in the world for centuries; and that, as they get on with life, I was sure these drinkers would eventually discover Bordeaux—especially reasonably-priced Bordeaux that shows the classic hallmarks of the genre. At any rate, if you can find these Légende wines, they’re worth checking out! En Garde’s Csaba Szakal has sent me his new wines for review. (I have not been paid for this.) The Pinot Noirs in particular are very good, providing plenty of cool-climate acidity and delicacy, as well as Russian River Valley fruity intensity. And they’re ageable. If there’s a criticism–a minor one–it’s that they’re all rather similar to each other. But En Garde wouldn’t be the only producer of boutique Pinot Noirs to deserve this critique. Producers still have got to rationalize their fetish with vineyard and other special designations. En Garde’s wines are costly, but the prices are fair, considering what California Pinot Noirs of this quality cost these days. 2016 Pinot Noir (Sonoma Coast), $60. In many ways this is the best and most delicious of En Garde’s new Pinot Noirs. On entry the palate is just delighted with the array of ripe fruits: red raspberry mainly, also persimmon, pomegranate and plenty of spicy clove and orange zest, with a tannic, tea-like grip. There’s a sweetness throughout, yet the wine isn’t sweet at all, but finishes nice and dry, with good balancing acidity. The oak is modest, bringing subtle, inviting vanilla and smoke notes. This is the lowest in alcohol of the winery’s new releases, with only a modest 14.3%, and a mere 175 cases were produced. Absolutely addictive, a beautiful, lithe, supple, succulent Pinot Noir with such a silky texture. My favorite of the whole bunch! Score: 96 points. 2016 Pleasant Hill Pinot Noir (Russian River Valley), $60. Delicate and silky. It’s quite translucent in color; you could read through it. But there’s nothing thin about the flavors. Opens with a blast of wild raspberries, pomegranates, cranberries and rosehip tea, with subtly pleasant notes from oak. There’s also a nice earthy component: dried mushrooms, spicy cloves, a touch of crushed white pepper and cinnamon. The finish is dry and intense. Makes me think of lamb chops or beef tacos or even paté or, if you’re vegan, a rich wild mushroom risotto. Very nice now, elegant and refined, if a little tannic and youthful. I expect it to continue on a good glide path for eight years, at least. I’d love to be around to try it in 2036, but I probably won’t. A mere 98 cases were produced, and the alcohol is 14.7%. Score: 94 points. 2016 Pinot Noir Reserve, Russian River Valley, $80. Only 121 cases were produced of this Pinot Noir, which is a selection of the winemaker’s best barrels (as a Reserve should be). The wine, in its youthful exuberance, is simply delicious. It is, as my friend, Allen D. Meadows (Burghound.com) describes certain Burgundies, “big and robust, though always with breed and class.” Opens with a blast of essence of ripe, succulent raspberries. Oak brings notable but subtle notes of smoky wood and vanilla. But it’s really the flamboyant fruit that’s the star of the show, with great supporting performances from acidity, soft tannins, a silky texture and a minor but scene-stealing bacon and rhubarb-infused wild mushrooms. It’s so delightful, you might want to drink the entire bottle, but it will hold for at least eight years. Alcohol 14.9%. Score: 93 points. 2016 Starkey Hill Pinot Noir (Russian River Valley), $60. Wine purists will want to know that the vineyard is near Sebastopol, near but not in the Green Valley AVA, one of the cooler sections of the Russian River Valley. You can tell from the color—translucent ruby—that it’s from a chilly area. I reviewed the 2014 Starkey and called it “lighter in body and more delicate” than some of En Garde’s riper Pinots. It still is. This is a delicately structured wine, with plenty of acidity and a silky texture. But there’s nothing shy about the flavors: big, bold cherries, tobacco and herb tea, plenty of peppery spice, a rich, mushroomy earthiness, and smooth, refined tannins. There’s enough elegant complexity to warrant the price. The wine changes interestingly in the glass as it breathes. With alcohol of 14.5%, it’s bit hot, but should mellow with at least six years in the bottle. Score: 93 points. 2016 Rossi Ranch Vineyard Petite Sirah (Sonoma Valley); $60. Pinot specialist En Garde turns to the warm Sonoma Valley for Petite Sirah, a grape that requires more heat to ripen than does Pinot. You don’t want to drink this ’16 quite yet; it’s just too young. The aroma is big and grapy, and the new French oak hasn’t yet integrated with the fruit. It’s also raspingly tannic, one of the most tannic young California wines I’ve tasted in a long time. Underneath all that are big flavors of mulberries and blackberries. A dense, dry, concentrated wine, inky black in color, with subtle, enticing notes of bacon and good acidity. Give it three years to begin to come around and then try again. It could still be ticking in fifteen years. 155 cases, alcohol 14.8%, but I’m dinging the score because of the tannins. Score: 88 points. 2016 Manchester Ridge Vineyard Chardonnay (Mendocino Ridge); $55. Even though the official oak content on this wine is only 20% new French oak for ten months, the oak is overwhelming. It’s strange, because sometimes, 100% new oak on Chardonnay is fine. Maybe it’s because the underlying fruit doesn’t have the guts to stand up to the wood. Hard to tell. Whatever, it’s toothpicks. The vineyard is in the Mendocino Ridge appellation that has to be above 1,200 feet in elevation in order to be so labeled. Yes, you’ll find ripe pears, citrus and tropical fruits, but the main impression, in both the smell and taste, is buttered toast, caramel and butterscotch. 14.4% alcohol, 110 cases produced. Score: 87 points. Wine critics vs. crowdsourcing: which is best? It’s never a good idea for wine critics to defend the field of wine criticism against its critics, because they end up sounding whiney and defensive. I got plenty of criticism during my time, and I never took the bait, but Eric Asimov did last week, and he shouldn’t have. His column, which ran in the Wednesday New York Times on July 18, was a rebuttal to what Eric called an “attack on wine critics” that appeared on the liberal news and opinion website, Vox. The Vox article argued several points, all of which undermine the importance of wine critics like Eric (and me, when I was working). The most important is this: “community wine reviews,” like CellarTracker’s, are better than, or at least as good as, professionally individual wine reviews (like those of Eric or Jancis Robinson), especially given that CellarTracker is free, whereas Jancis charges $110 a year for her subscription, and to read Eric, you have to subscribe to the New York Times. He resorts to an ad hominem argument in blasting the study Vox cited, calling it “dense [and] statistics-heavy,” as though the fact that a study contains numbers and tables somehow makes it suspect, which of course isn’t true. He attacks, too, a video that accompanied the Vox article which showed Vox employees blind-tasting wines. “While they were able to identify the most expensive bottles with some consistency, they far preferred the cheaper ones,” Eric wrote, adding, “The conclusion: ‘Expensive wine is for suckers.’” This is a conclusion that rankles Eric a great deal. But to me, the most shocking part of Eric’s column lies in his statement that “It’s not surprising to see this [sort of attack on critics] again, at a time when knowledge and expertise have been dismissed at the highest levels…”. You know exactly whom Eric’s not-so-subtle remark is directed at: Donald J. Trump and his legions of fact-free followers. I defer to no one in my condemnation of and contempt for Trump and Trumpism and its war against scientific and historic fact. Readers of my blog know that I’ve warned about this dangerous know-nothingism for a long time. But to equate questioning the value of wine critics with attacks on the science of global warming is hyperbolic to the extreme. It’s a desperate resort to the emotions of the Times’ readers: Eric knows that the vast majority of them loathe Trump’s war on “knowledge and expertise,” and he seems to be trying to convince them to turn against critics of wine critics, as well. It’s a positively Trumpian move. Let me give my judgment, after tasting hundreds of thousands of wines professionally, at the highest levels of the industry, for twenty-five years. First, critics don’t agree amongst themselves. That should tell you something. Secondly, inexpensive wine can be as good as expensive wine. I need to parse this sentence, because it’s complicated. First, “inexpensive” and “expensive” are obviously relative terms. Second, when I say “good,” that also is a relative word: “goodness” in wine (as in films) is strictly in the eye of the beholder. You might love that $11 bottle of Croatian white wine. Jancis or Eric (or I) might hate it. That doesn’t make your taste any less authentic than theirs’, which is the whole point of the Vox article. Eric, who has devoted a lifetime to the knowledge and understanding of wine, deservedly wants to be acknowledged; when his “knowledge and expertise” are dismissed so lightly, he becomes affronted—as well he might. But we’re not concerned here with Eric’s feelings. We’re concerned with the best approach for consumers to take, who are overwhelmed with the mysteries of wine. Eric suggests that the smart consumer will turn to a professional like him for the best advice. But the Vox article says definitively that crowd-sourced reviews are at least as correct, or right, or spot-on (whatever word you like) as the reviews of a single professional. And I simply can’t disagree with that. It’s true; it’s a fact; it makes sense, and there’s no getting around it. This isn’t to say that wine critics don’t provide a very valuable service. If you find a critic whose tastes align with yours (no easy task), then you should feel free to follow that critic. Critics have the additional benefit that, because of their knowledge and expertise, they’re a delight to read. I love reading good wine critics (including Eric), because they write so well, and they’re able to put a wine into context, beyond their mere hedonistic review. (My favorite current writer is Benjamin Lewin.) Wine is complicated, elusive, the product of the marriage of history, geography, grape and fermentation science, human artistry, climate, entrepreneurial business and marketing and so on; a good writer, like Eric, captures these complexities for us and educates us about the wine, which makes its consumption all the more enjoyable. So I’m certainly not dissing wine critics! But I am saying that to write a whiney, defensive tome like Eric did is not in his best interests, or those of knowledgeable wine criticism. Very few people read the Vox article because very few people read Vox. Eric’s position atop the heap in American wine writing is unchallenged. He shouldn’t have wasted his time.